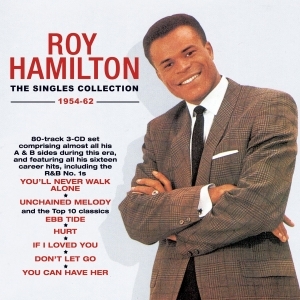 Roy Hamilton was one of the truly individual and innovative performers of the R&B and pop scene during the 1950s and early ‘60s as he combined his classically-trained vocal style and his roots in black gospel music to bring another dimension to interpretations of contemporary pop and R&B material as well as to classics of the Great American Songbook to achieve a string of pop and R&B hits during these years. Along the way, he also provided inspiration for R&B and soul singers who followed in his wake, most notably Brook Benton, for whom he was a significant mentor, and Sam Cooke, encouraging him to turn towards secular music. Elvis Presley also credited him with influencing his ballad-singing style, while the Righteous Brothers also drew on his hit repertoire. This great-value 80-track 3-CD set comprises almost all his A & B sides recorded for the Epic label during this era, and features all his sixteen career hits he achieved before his untimely death from illness in 1969, including the R&B No. 1s “You’ll Never Walk Alone” and “Unchained Melody”, and the Top 10 classics “Ebb Tide”, “Hurt”, “If I Loved You”, “Don’t Let Go” and “You Can Have Her”. It’s a comprehensive introduction to an artist who has not received the attention or recognition over the years that his influence and success merits, and it offers a substantial and enjoyable showcase for a highly distinctive vocal talent.